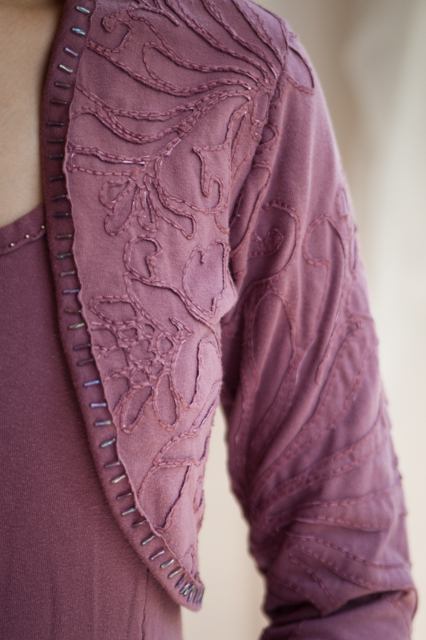 And in the category Took Forever/Worth It, this bolero in Wine cotton jersey, stenciled with the "Magdalena" stencil, stitched in embroidery floss, then reverse appliqued (that just means the stenciled shapes are cut out after they are stitched around). These little jackets are perfect for me. I wear them over matching and non-matching jersey dresses. They are just big enough to host a Stitching Statement without taking a year to make, and they are big enough to let you really develop the pattern but not make you crazy. The Magdalena stencil, which I downloaded and cut out of acrylic pennant felt, is enormous, and interestingly runs from a very small scale design to a much larger scale. You can play with this when placing the stencil on your pattern pieces. That's stunning Anna, both the colour and the pattern. Wow! That is beautiful! 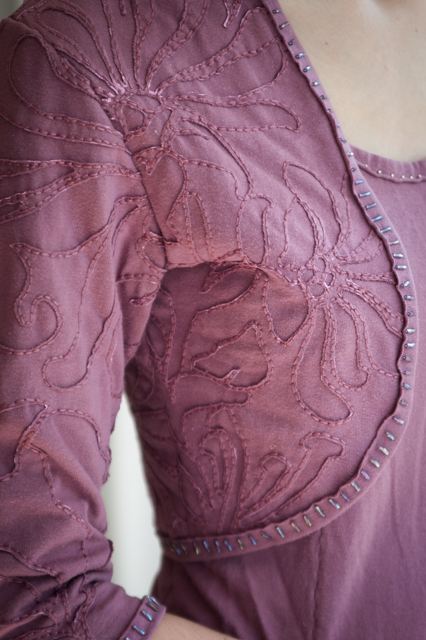 I love the color, and your careful stitching is incredible. and the beads add so much. I just know you will enjoy this so much! Wow, again. You inspired me to try the Alabama Chanin sewing style but I hated the drag on the needle when hand sewing jersey. I don't know how you do it. Another fantastic AC project. You keep me inspired! All your stitching is gorgeous. Is it difficult to cut cleanly within the stitched areas or is this something that comes with practice? Jenny, the cutting is definitely the most tedious part for me. It's a lot easier if I remember to stitch far enough away from the paint! You did one for Bella that was navy blue and orange...you showed a closeup as you were working on it but no finished product, I don't think. Do you have a picture of that? The color combo was amazing and unexpected. I love this too. You're so cool, Anna.